The Spider Returns © Columbia Pictures Corp. The Spider TM & © Argosy Communications, Inc.
A definite come-down from The Spider's Web, one of the best serials ever made -- but Returns is not without elements to recommend it. Warren Hull and Kenneth Duncan reprising their roles are reason enough to watch all fifteen chapters! Unfortunately, the new cast members are a mixed bag. Dave O'Brian (who also doubles Warren Hull in stunt sequences, as he had in Web) is closer to the brawny ideal of Jackson than Richard Fiske, but Mary Ainslee's Nita is a shrieking embarrassment. The fact that the pacing isn't as crisp, and that many bits are played unsuccessfully for laughs, can be attributed to the solo direction of James W. Horne, who is more famous for his work with Laurel & Hardy. This is not the worst serial that Horne or Columbia ever made by a long shot, but we are now on the downward slope of their cliffhanger output. 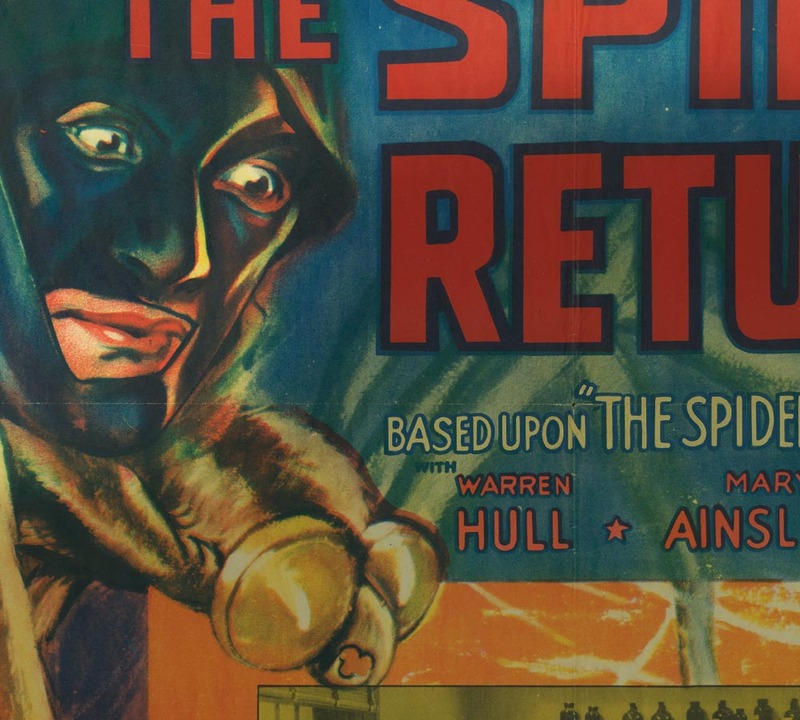 NOTE: Several sources online and elsewhere have connected pulp author L. Ron Hubbard with The Spider Returns, claiming that he was an uncredited contributor to the script. If Hubbard did in fact work on a Spider serial it would have been The Spider's Web, since that jives better with his 10 weeks in Hollywood. He travelled there in May 1937 to adapt his own novel Murder at Pirate Castle for the Columbia chapterplay The Secret of Treasure Island (1938). It is said that he also worked on the serials The Mysterious Pilot and The Great Adventures of Wild Bill Hickok. A chapter-by-chapter account of The Spider Returns' exciting-yet-repetitive plot as detailed by the Columbia promotional department. Information on newcomers Dave O'Brian (Jackson) and Mary Ainslee (Nita), along with links to my Web pages on Warren Hull and Kenneth Duncan. Here are all the images I have collected from online sources or scanned from my own collection.